One of the requirements for most long term visas in Spain is to acquire medical insurance in Spain. 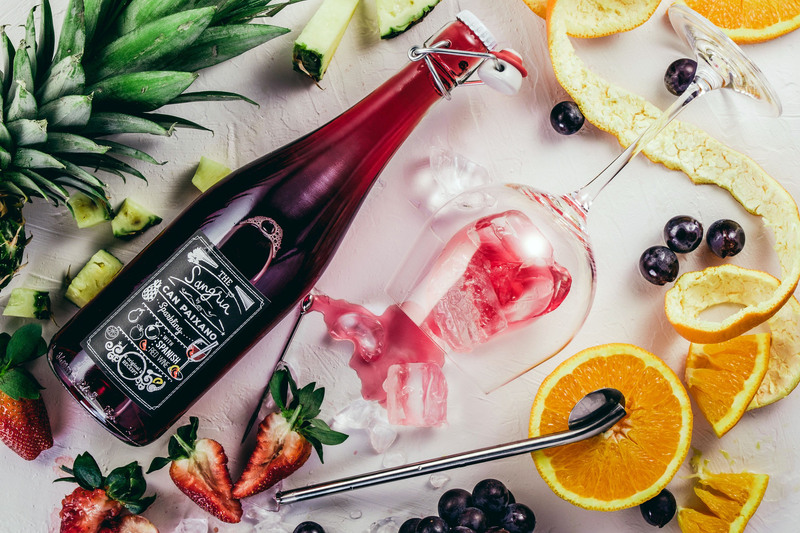 This requirement can be satisfied a variety of different ways, such as obtaining long-term (1 year or longer) travel insurance that has worldwide coverage, or by obtaining coverage from a private company in Spain. In terms of the non-lucrative visa for Spain, the coverage must allow at least €30,000 of coverage per year, and also not have a co-payment component. A co-payment (in North American terms) would be more like a deductible, that is a type of fee you have to pay every time you go visit a doctor or have any health services. The rationale with a co-payment plan is that it encourages people not to visit the doctor for every single issue, since they have to share in the cost of the coverage. For most long-term Spanish visa requirements, the consulate instructions often say the plan must not have a co-payment component. So this is something to definitely be careful about when you purchase a plan. The primary plan that most people told me would satisfy the requirements was the Sanitas Mas Salud (without co-payments) plan. Sanitas is a very large private health insurer here in Spain, and they have a good reputation. I contacted a few agents for Sanitas (such as Sanitas Expat) and received a quote of approximately €72 per month. At about the time I was getting ready to go ahead with that option, I went into BBVA to open a bank account as a non-resident. During the application process the lady told me that they had a special deal with Sanitas, and if I needed coverage she could work some magic for me. I asked her to give me a quote, and for a no co-payment plan with Sanitas, she said it would be roughly €38/mo, which is a pretty big savings. She also offered to waive my yearly bank account fees if I signed up with that plan, which would be another savings of approximately €60/year. So together, it seemed like a pretty great deal. I did some research to determine what the difference was between the two plans. The original one I received a quote for was the Sanitas Mas Salud without co-payments, and the second one was the Sanitas Autónomos without co-payments. The second one seems geared towards people who are self-employed, while the first one isn’t. I emailed Sanitas to get a clarification, and the agent I managed to track down said the plans were virtually identical, except the second one typically requires a person to pay into the social security system here to qualify. Since I don’t pay into the social security system here, I went back to the bank to try and sort out if I was actually eligible for it. She assured me it was a special deal for BBVA bank members, and I’ll admit, I wasn’t entirely convinced. But she pointed out that ultimately it was Sanitas’ decision, and the only information they had for me was my address as a non-resident and my passport information. So anyways, I decided to just go with the flow and see what happened with it. In total, assuming this medical insurance went through, it’s approximately of savings of €516 per year, which almost pays for the non-lucrative visa itself. I went back over the course of a few days here in Spain and each time I went back the bank still hadn’t received the approval. I went back again the last time, and sure enough, she said it had been approved. She helped me login to the Sanitas website, where it showed proof of my coverage as well as my contract with them. If my non-lucrative visa application has any issues, I suspect it will be with regards to the nature of this medical insurance. In truth, the main reason I have it is to satisfy the visa requirements, as my Canadian medical insurance plus additional travel insurance will still apply to me for the first six months I am in Spain, so I’m not actually that worried about the coverage itself (yet). Also, the bank agent gave me her email and phone number in case there were any future issues, at which point she said I could adjust the plan if required. But I’m hoping since I have proof of insurance, even though it’s a plan geared towards self-employed people (which at some level I am, just not in Spain currently), that it will be enough for the consulate in Toronto. The entire process took roughly a week, and likely went smoother because I was actually in Spain at the time. But there are various Spanish companies (targeted towards expatriates) who represent Sanitas, so your best bet is to contact one of them. There are also many other insurers you can use, but I felt the most comfortable myself using the largest insurer here. I’m currently in the process of applying for a non-lucrative visa to come live in Spain for a year. While there are many different visa options you can apply for to enter Spain – such as a work visa or a student visa – the non-lucrative visa is great for people who want to enjoy Spain without being a student or working locally. The name, “non-lucrative”, basically refers to the fact that you can’t earn any money with it. Unfortunately what that means is a bit confusing (as are many other things about Spanish visas in general, but we’ll get to that shortly). Basically Spain wants you to have an income stream for a year, but not necessarily get it by doing any work (and certainly no work in Spain itself). Some people interpret the visa to mean that you can obtain this visa while working remotely and earning money in another country. So if that’s how you interpret this (and more importantly, how your consulate interprets it), then you are fine with applying for this visa and showing an income stream in another country to satisfy the requirements. Another way to interpret this though is that you can’t be actively working in any country while holding this visa. I tend not to share this viewpoint, since technically even if you have passive income from investments in another country (like Canada, for example), it’s still income, and would likely be included on your tax return wherever you are. But this is a point of contention because people applying for the visa, as well as the consulates themselves. Documentation proving economic funds sufficient for the duration of residence or proof of a minimum reoccurring monthly income. The minimum amount will increase for every additional member of the family. There must be proof of significant savings and proof of re-occuring, non-working income. So they indicate that your income, if it’s recurring, must not be from active work – in other words, this income should likely be produced from investments. Which seems to indicate that it’s fine to work, as long as that activity isn’t in Spain. You must prove that you have enough means to live in Spain without working for the whole period that you want to stay in Spain. Which seems to indicate that you can’t work at all. Confused? Hold on tight, because we’re just getting started! I think the safest option is to simply have enough savings to support yourself without working for the entire year, at least in terms of the application process. The current guidelines say you need to have at least 2,151.00 Euros available per month, or 25,812 Euros per year. So if you have that in some form of savings such as a retirement fund, bank account, or long-term savings account, you should be fine. A valid passport or travel document recognized by Spain with a minimum validity of one year (some consulates only need six months). A Police Check issued by the authorities of all the countries where an applicant has resided for the last 5 years, including Canada. NOTE: The Police Check should be issued by the RCMP and contain the fingerprints of the visa applicant. You can find information on how to obtain one here. We will not accept Police Checks issued by local Police Stations. A public or private medical insurance with an insurance company authorized to operate in Spain. Visa fee: CAN $ 91.20 (year 2018), except when a reciprocity fee applies to other countries, such as Canada and USA. Visa processing fee for Canadians is $ CAN 762.00. Please refer to the consular fee chart for other nationalities. Only cash, money order or certified cheque payable to the “Embassy of Spain” will be accepted. Non-lucrative residence permit fee: CAN $ 16.10 (year 2018). Only cash, money order or certified cheque payable to the “Embassy of Spain” will be accepted. I’m guessing Canada did something really bad to Spain at some point, which is why we get hit with an extra $762 reciprocity fee. We’re sorry, Spain, please don’t hate us. I’ll update each of the above items as I work my way through the process, as there is confusion at many of the steps. In addition, at least in Canada, it’s next to impossible to get ahold of anyone either by email or telephone at any of the Spanish consulates. Which basically means you have to rely on whatever information you can find. Some consulates seem to want everything that’s in English to be translated (officially) into Spanish, while some seem to be fine with everything being in English. 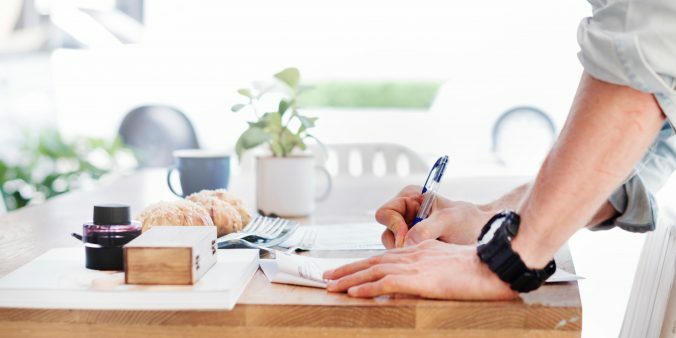 In addition certain documents (such as the criminal record check) also potentially require an Apostille (legalization of a document for use in another country). Send that document to the department of foreign affairs where they will verify that the signature on the document is legitimate and stamp the document saying it’s official. Only after all steps have been done will the document be considered legal and official for use in Spain. There’s confusion as to whether this is necessary at all embassies (and in fact, given that the criminal record check comes from the government, seems completely redundant to have yet another government department verify the document, at least for use in Canada), but that’s what some people seem to have to do. In the United States you’ll need to find someone to act as an Apostille for your criminal record check. Once you gather all the required documents (and pay your fees of course) and send them to the consulate, you’ll be able to live in Spain for a full year. I’ve heard in the US it often takes less than a month to be approved, but in Canada you should expect more like three months. I’ve also been told it’s a good idea (and a silent requirement for some consulates) to include proof of travel to Spain for after you obtain your visa. That seems a bit risky to me, since you aren’t entirely sure when your visa will be complete, but I know some consulates (namely the one in Toronto) have asked other people for it prior to approving their application. At some level it may help guarantee you get your visa back before a certain date, but the consulates also say they aren’t liable if they don’t get it back to you in time, so it’s definitely a financial risk. I’ve chosen to be an optimist, and have booked a flight back to Spain, timed to be approximately three months after the date I plan to submit my application. Once the process is done you’ll hopefully receive your passport back with a Spanish visa inside that’s valid for 90 days. You have to get to Spain generally within a month, after which you will obtain a place to live and apply at the local police station for your residence card. Once you have the residency card, I’m told the renewal process each year is much simpler, involving only showing proof of income or proof of funds, and also proof that you stayed in Spain for at least six months each year. Given that the residency permit is renewable twice for two years each, in theory once you obtain your non-lucrative visa you can live in Spain for up to five years. And after those five years are up you quality for permanent residency, which would start the five year clock towards becoming a Spanish citizen. I’ll update this post as I complete each of the steps, but with luck I’ll have my non-lucrative visa in four months. Last winter I was sitting around a bar near Vancouver, BC, watching the rain fall down while sipping an India Pale Ale. I was thinking about my upcoming trip to Europe, still about four months in the future, and talking to a friend of mine about just how bored I was. Instead of living life, I guess the truth is I sort of felt like my life was on hold until that plane lifted off again, taking me to Europe. Over the last six years or so, I have visited roughly 39 countries while working remotely. And for me, Canada has always been my home base I go back to. But often I end up in Canada during the winter months, which are quite depressing (rainy and cold for months), even though I have the ability to be anywhere due to my job. But unfortunately renting my Canadian cottage out during the winter months is a bit of a challenge, and it doesn’t make sense for me to leave it empty while I travel the world, since I still have a mortgage on it and monthly payments to contend with. Of all the places I have visited over the last few years, only a few have stood out in terms of places I would actually want to live for a long period of time. Of those, Spain is one country I always seem to love coming back to – I love the people, the climate (320 days of sunshine a year in some areas), the beautiful architecture, and the proximity to the Mediterranean. 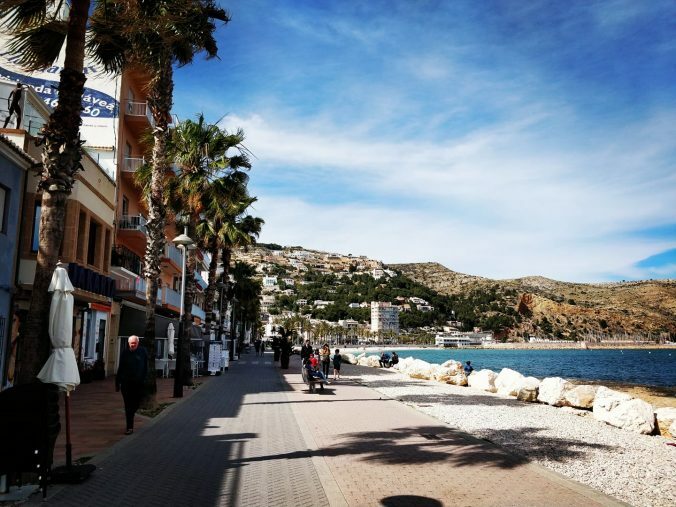 So not long ago, I came up with a solution to my winter dreariness problem – what if I actually rented out my cottage for a year and simply moved to Spain? While it’s hard to rent my place just for the winter, it’s much easier to rent out if it includes the summer too since I live near a lake in a resort-like area. Plus, moving to Spain would finally let me finish learning Spanish too, which is something I’ve wanted to do for a long time. I actually recently had a conversation with a new friend about ticking off boxes in your life. That is, if you made a list of five to ten things that were important to you, where could you live in the world that allowed you to check off the most boxes? For me, learning Spanish is near the top of that list, as is being able to sail from time to time (I learned how to sail in New Zealand years ago, but haven’t had the chance to sail since). I also would like to get in better shape, so somewhere where I can be outside for longer periods of the year I imagine would help with that (I hate going to the gym, but love doing things outside like rollerblading, etc.). So in terms of checking off boxes, moving to Spain would help me tick off almost all of them – it would allow me to skip a dismal four to six months of rain and cold back in Canada, let me finish learning Spanish, give me access to the Mediterranean (and hopefully a sailboat), and also let me spend more time outside each year – sounds heavenly! In terms of visas that would let me move to Spain for a year as a Canadian, there are really only two visas that apply: the entrepreneur visa, or the non-lucrative visa. The entrepreneur visa is available to anyone who wants to open a company and employ Spanish workers. I’m not opposed to that at some point, but it seems pretty daunting to open a company if you don’t even have a comfortable grasp of the language. So I scratched that one off the list for now. The non-lucrative visa is much easier to get with two caveats – you can’t work in Spain with this visa, and you must be able to provide proof of income (or savings) for the entire year. Since I sold my company a few years ago and still have a chunk of money in the bank, I should easily qualify for this visa. So right now I’m actually in Spain on a tourist visa, working through opening a bank account and acquiring medical insurance. In about a month I’ll head back to Canada, and with luck, submit my entire application for the non-lucrative visa. I’m also in the process of renting out my cottage back in Canada, so hopefully will have that sorted out shortly as well. So hopefully in approximately four months I’ll be on an airplane, heading towards Madrid, ready to spend an entire year living and travelling around Spain. I can’t wait! In just a month, I’m hopefully going to submit my documents to apply for a Spanish long-term visa so that I can live in Spain for a year or longer (and potentially buy a property). As part of all long-term visa applications, Spain requires proof that the applicant is in good health. 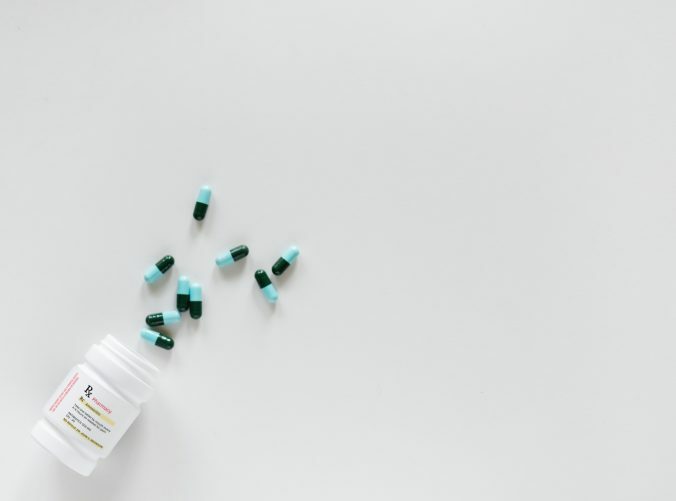 For the most part, what they are concerned with is that you don’t have any infectious diseases that can be spread to others, which would be an economic drain on the health care system in Spain. In terms of proof of being in good health, you are going to need a document that’s in English and Spanish (or one that is in English, and then translated by an official Spanish translator into English) that says not only are you in good health, but also that you do not “suffer from any illness that would pose a threat to public health according to the International Health Regulations of 2005.” That last part is the key to the whole document, as it absolutely must say you have nothing that’s part of the International Health Regulations of 2005. My original plan was to meet up with my family doctor in Canada and ask him to sign a certificate stating that. But doctors in Canada unfortunately aren’t usually too happy when they have to do things that aren’t normally part of their job. I imagine I could have convinced him to do a series of tests to prove I was healthy, and then have that document translated, but I came up with what I thought with a better plan – since I was already in Spain visiting, I decided to simply try and get the document here. I emailed a few doctors here in Spain, and one of them said for 60 euros he’d be happy to issue me a medical certificate. I sent along the verbiage I wanted, in both Spanish *and* English, after which he read it over and said he was fine with it. So a few days ago I met with him and we went over my entire health history. He tested my blood pressure, and then asked me about my infectious disease history. I told him I normally donate blood every 2 – 3 months, which he was really happy about since they screen for all those ailments during a routine blood donation. I showed him proof of my last donation, along with the results I had for some recent blood work I had done back in North America, which satisfied him enough to deem me healthy for immigration purposes. If you aren’t so fortunate, I imagine they will ask you to submit either a blood or a urine sample to test for some of these. But in my case they accepted proof that I had been screened relatively recently via a blood donation. Once the appointment was over, he said he would prepare the official certificate for me in about an hour. So I walked down the beach, had a café cortado, then came back and picked up the completed certificate. This certificate verifies that Mr./Ms. 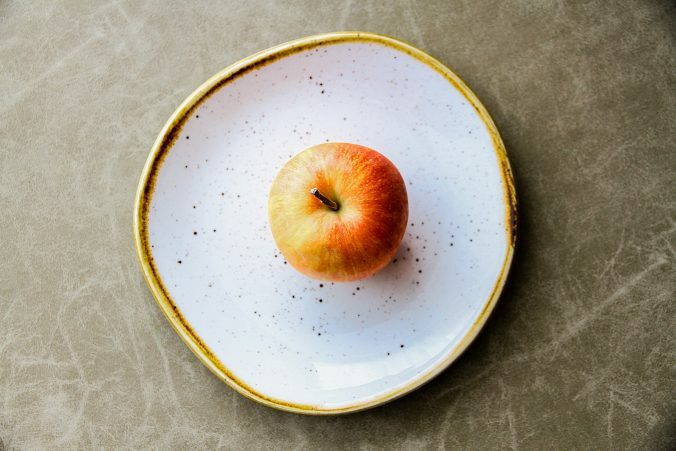 _______________ is free of drug addiction, mental illness, and does not suffer from any disease that could cause serious repercussions to public health according to the specifications of the International Health Regulations of 2005. These contagious diseases include, but are not limited to smallpox, poliomyelitis by wild polio virus, the human influenza caused by a new subtype of virus and the severe acute respiratory syndrome (SARS), cholera, pneumonic plague, Bellow fever, viral hemorrhagic fevers (e.g. : Ebola, Lassa, Marbug), West Nile Virus and other illnesses of special importance nationally or regionally (e.g. : Dengue Fever, Rift Valley Fever, and meningococcal disease). You can see the entire document here at the LA Consulate. You’ll need to make sure the doctor signs and dates it, and also attaches their official stamp to it. 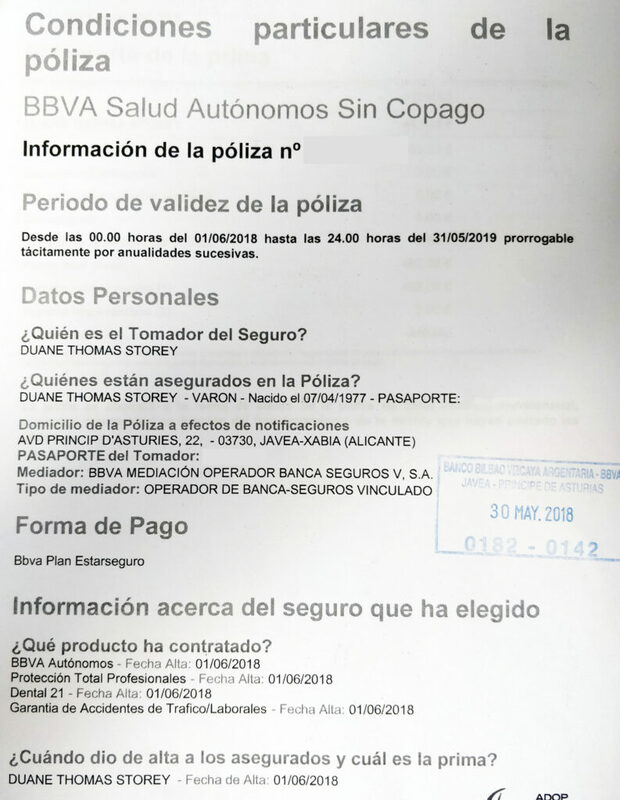 Altogether I spent 60 euros on the medical certificate, and won’t require an official translation since the document is written in both English and Spanish (and the doctor signed off on both portions). The only caveat is that each medical certificate is only valid for three months, so now the clock is ticking to submit my entire package. But right now my plan is to submit it sometime at the start of July, so I should be fine. If you’re looking for any help with this process, make sure you join our Facebook page and exclusive Facebook group. We also send out updated information from time to time via our mailing list, and you can sign up for that below. So if you’re here, you’re likely thinking about moving to Spain at some point. I know this, because that’s my end goal as well. Maybe not forever, but likely for a year or more. One of the first hurdles you may encounter is opening a bank account. Once you have a long-term stay visa or a temporary residence in Spain, you can open an account as a resident. But there are certain advantages to having one sooner. For example, I thought moving larger amounts of money from Canada to Spain would probably be much easier when I am actually physically present in Canada, so I thought opening a bank account before heading back should make things smoother. Given that I was in Spain for a month recently, I decided to go down to the bank and try to open an account – you need to be physically present in Spain to open one as a non-resident. While I speak enough Spanish to usually get by, I wasn’t confident that I’d be able to navigate the wide world of banking with my limited vocabulary. At this point I could have found someone local to help me, or hopefully someone who speaks english at the bank. In terms of choosing a bank, you have a lot of options. After asking around most people locally recommended BBVA or La Caixa to me, since they have really great online access as well as mobile phone access. Since that will likely be how I use most of these accounts, I decided to go with one of those. And since BBVA was right around the corner from where I was staying, a few days ago I walked in there. Luckily for me, I found someone who speaks english, so it made the process much easier. When I asked her what documents I need, she told me she needs my passport, proof of income back in Canada, and something to show I’m still a resident back in Canada. I went back to where I was staying and printed out a few pages from my 2017 Canadian tax return, and also my latest cable bill with my Canada address on it. When I went back with these documents, she looked over them and said they were fine. At this point, she told me to go home and come back the next day, as apparently the bank account needs to be approved at their head office. When I came back the next day at roughly the same time, she checked and everything had been approved. At that point she helped me set up the BBVA app on my phone and make sure it was working for me before I left. I was actually amazed just how far ahead the Spanish were in terms of banking, possibly due to the ease of use of the IBAN number here compared to our complicated institution/branch/account format back in Canada. But you can simply scan a barcode to send a friend or a company money from the application, which makes paying bills trivial each month. Tomorrow I’ll receive my Visa/Debit card (apparently you can use the same card for both – withdrawing money from your account, and also paying for items in stores and what-not – once a month the card will pay itself off from my bank account, which is fine by me), but for the most part after only 48 hours my bank account was ready to go. One of the first issues I wanted to solve was how to exactly fund the account from Canada. Canada banking is pretty archaic, and I assumed I would have to take my Spanish banking information into a branch in Canada and set up an international wire transfer. Those transfer are error-prone, and usually quite expensive ($20 fee to send, and often $20 to receive). So I was looking for something that was cheaper. I found a few people talking in various online forums about using TransferWise, so I decided to give that a shot. Basically TransferWise is a company that facilitates transferring money between international accounts with what they claim to be really low fees. I quickly added my Canadian bank account information into TransferWise, and also my Spanish bank information. Once that was done, I simply clicked ‘Send Money’ on the Spanish bank account and started the process. Once you start the process, you can select how much money you want to send and also see all the relevant fees. The cheapest option in my case is to directly fund the transaction from my Canadian bank account. But there are other options too, like starting a wire transfer, or even funding via a credit card. The fees are a bit deceiving in that TransferWise boasts really great currency conversion fees – this seems to be true, but instead of those fees changing, the actual “Our Fee” field seems to be based on a percentage as well. So instead of a 3% currency spread at most banks, you’re looking at roughly a 1% total fee for the transaction with minimal explicit exchange fees. It’s still roughly a 1% fee, but I doubt I could do any better myself in person, not without using a Forex company to exchange a larger amount of money. And in that case, it would take me two or three individual transactions and a lot of stress to pull off. I thought for some reason when I started this transaction that it would simply grab the CAD from the Canadian bank account I set up. But in terms of TransferWise’s terminology, those accounts only seem to be destinations, not sources. So once you initiate the transaction, you have to fund it yourself, either by doing an explicit transfer to TransferWise (they give you the information after you start), or by linking your bank account to the transaction (by clicking on your bank icon, like TD Bank in Canada, and authenticating). Once that was done, TransferWise started the transaction. TransferWise is really great at letting you know what’s going on. 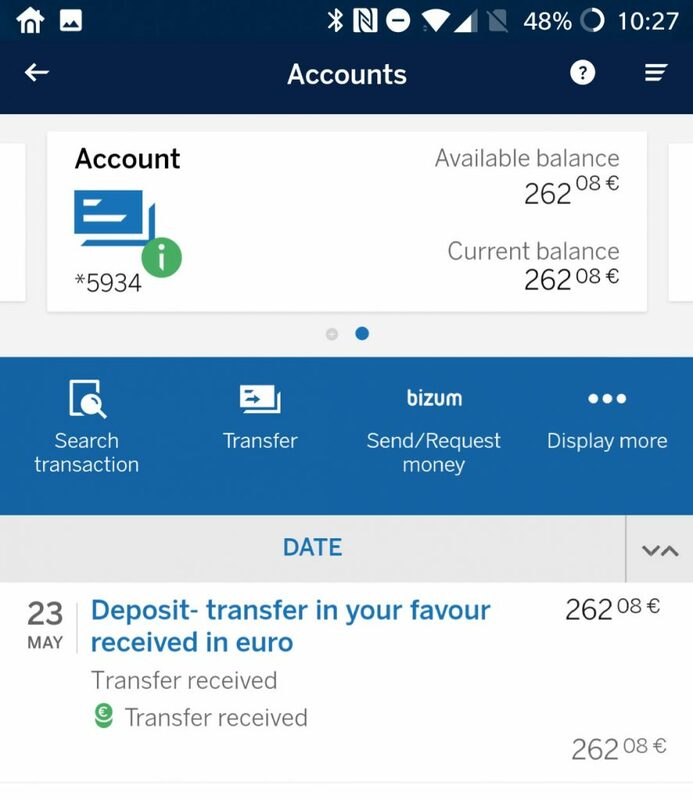 For example, the moment my TransferWise transfer received money from my Canadian bank, TransferWise sent a push notification to the application on my phone, as well as an email. Both of these let me know they had money, and were now converting it between currencies (at the rates they advertised previously), into Euros. Later that evening the money physically (or virtually I guess) showed up in my account, and was listed on the BBVA application. All in all it took about 24 hours to move money from my Canadian bank account to my Spanish one, and cost me approximately 1% in the process (or about $4 on $400). 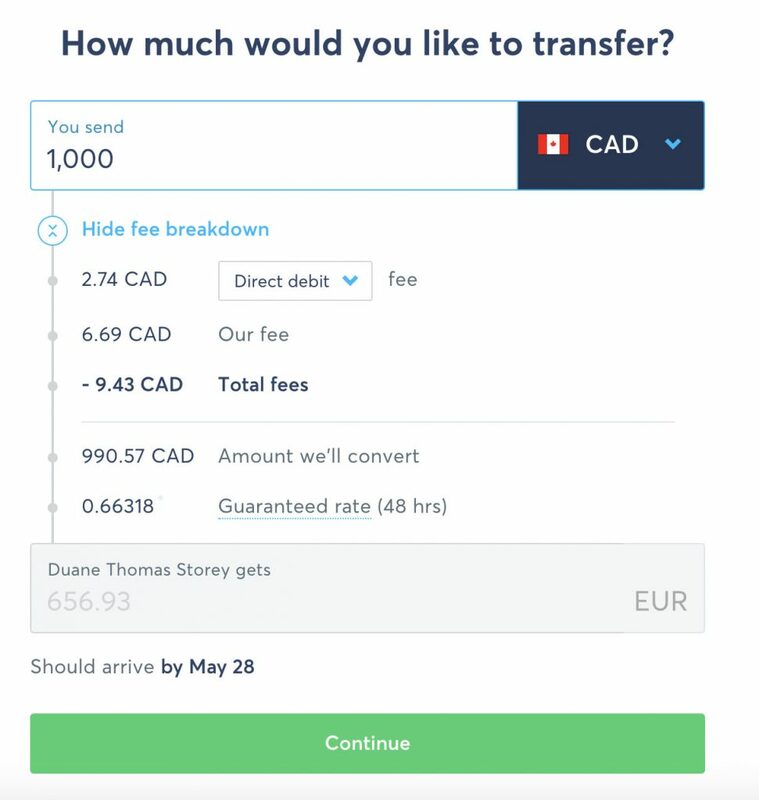 If you’re looking to move money between your accounts, I definitely recommend using TransferWise – the process was really straightforward, and the transaction completed in probably the same amount of time it would take if I was trying to send money to someone else in Canada. Plus, their exchange rates seemed to match what Google said the rates were at the time, even though they had an explicit fee that seems to be roughly 1% of the total. But as I mentioned, I doubt I could do much better myself by moving money between two currencies, and certainly not without a bunch of hassle and stress. If you want to sign-up to TransferWise, you can do it by clicking here (affiliate link – if enough of you decide to use it, I may earn enough to buy a few beers 🙂 ). But regardless TransferWise is going to be my go-to tool for moving money from Canada to Spain while I am here. All in all the process took about 2 hours of time spread out over roughly a week. The account was active after the first 48 hours, but took roughly a full week before I had the Visa/Debit card in my hand and money in my account. So if you are in Spain and want to get this done, make sure you have enough time in one location to see it through.